Despite digital conversion, organizations are still moving information around in document format. Securing shared documents with trusted partners, clients, and collaborators can be a challenge. Do you ever worry or wonder about what happens to documents after they leave your domain? Who has access? Will the information be copied or scanned and sent to an unintended recipient? Will the document be intercepted by a "man-in-the-middle" attack by a bad actor? Protecting sensitive data both in transit and at rest is imperative for modern organizations as attackers find increasingly innovative ways to compromise systems and steal data. Data in transit, or data in motion, is data actively moving from one location to another such as across the internet or through a private network. Data protection in transit is the protection of this data while it’s traveling from network to network or being transferred from a local storage device to a cloud storage device, or during an input/output process - never the less, wherever data is moving, effective data protection measures for in transit data are critical as data is often considered less secure while in motion. Because of its nature, data at rest is of increasing concern to businesses, government agencies and other institutions. One of the best ways of securing the data is to restrict access, however businesses need to have data accessible to authorized users, both internally and remotely The fundamental premise of data security provides that informational assets remain confidential, maintain their integrity and be available1. Accordingly, it would seem reasonable to require that the document repository be secure, but easily accessible to authorized users, both internally and remotely. Your need to protect confidentiality extends past beyond the borders of your business. Another layer of protection that can increase the level of security for your data is encrypting the file itself, regardless of the file location. Having the ability to limit the time frame that a file is accessible, even for authorized users, as well as revoke access even after a file has left your domain could provide an even higher level of protection. Most comprehensive print management solutions provide users with the ability to place a watermark across pages when printing and/or scanning as a method of preventing sensitive information from being reproduced. Utilizing this feature allows the author to designate documents as confidential, copyright protected or a draft version not for distribution. 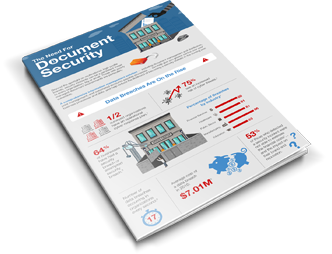 As print migrates more and more from traditional analog offset print processes into the world of digital high speed variable print processes, so must the security features used to secure crucial hard copy documents and documents with intrinsic value. Any type of document with intrinsic value may be targeted by counterfeiters. Whether you need to prevent altering or copying and pasting from a digital document, or photocopying a hardcopy original, the need for protection is paramount. If you are a service provider, you can help address your clients concerns by demonstrating your ability to offer a variety of solutions to help protect their intellectual property and sensitive data. Arcis Solutions helps to protect against illicit reproduction of printed documents, such as checks, tickets, receipts and more. With Therefore™ information management solution, you can revolutionize the way information is managed in your organization. Vera’s data security platform secures any kind of data and then tracks, audits, and manages access in real-time, no matter how far it travels. Vera's data security platform secures any kind of data and then tracks, audits, and manages access in real-time, no matter how far it travels. With Therefore™ information management solution, you can revolutionize the way information is managed throughout your organization. Interested in finding out how Canon Solutions America can help you secure your company’s information? Canon offers security features that can help your business. Many variables can impact the security of your devices and data. Canon does not warrant that the use of its features will prevent malicious attacks, or prevent misuse of devices or data or other security issues. Nothing herein should be construed as legal counsel or regulatory advice concerning customers' compliance with laws related to privacy and security. Customers must have their own qualified counsel determine the feasibility of a particular solution as it relates to regulatory and statutory compliance. Some security settings may affect device functionality or performance. You may want to test these settings before deploying them in your environment to ensure you understand their effects.